Another new protoype and Raspberry Pi! I wish to thank everyone that mentioned using my new DroidBuilder store when they ordered kits from me! Your emails gave me the confidence to roll all the links on the site over to the new store sooner than they otherwise would have been. It has been a very busy moth for us here at DroidBuilder.com. We've uploaded the first of our multi-controller tutorials in the "Programming the RoboVoice Shield" page. It currently includes code for both the Arduno and the Stamp BS2 MicroControllers. We have also been playing with a new prototype board for some months now and finally have some photos and a demonstration to reveal here in our blog. Talking about my new multiple MicroController theme, I just recently have started playing with the Raspberry Pi board which essentially is an inexpensive (about $35 US), Linux desktop computer about the size of a credit card (just slightly bigger than an Arduino). The idea is to eventually add Raspberry Pi code (written in Python) to my shield programming tutorials. The Raspberry Pi isn't exactly a buy it and you are ready to go type of board. Several things it needs are cables to your TV (either an HDMI cable or the old style RCA video cable). A USB style phone-charger power supply, a USB keyboard, a USB mouse, and an SD flash card with a version of Linux flashed on the card (Raspian (which is a light version of Debian Linux, or Adafruits Occidentalis which is the OS I am using). BTW flashing the OS onto the SD card is not so simple as dragging from you download folder to the flash - no you need some special software for that!) Complete details and instructions can be found at the Rasberry Pi Spy website or AdaFruit's learning center. Still though, even with all those items added in, for less than $100 US you can have a little pocket size computer just as powerful as just about any desktop back about 2005! Just this last week I found you can also get a version of Android to run on the Raspberry Pi! The Raspberry Pi is an amazing little board, not quite as easy as an Arduino to get going, but with it you can browse the web, watch videos, or use it as a brain for your next robot or weather station. A little more info about the Raspberry Pi and its founders can be found at the New York Times news website. 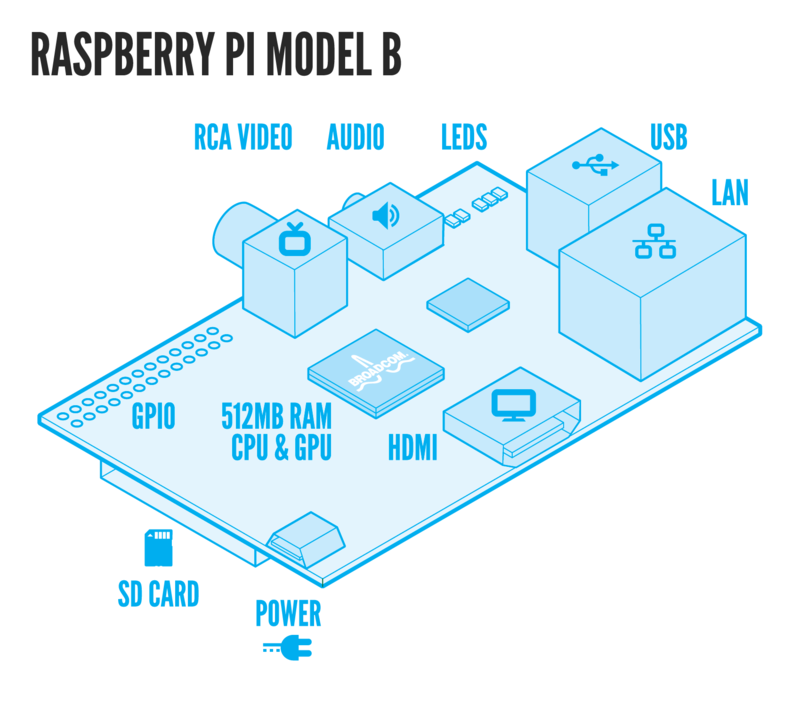 The drawing below shows the available Raspberry Pi interfaces. The GPIO is where my RoboVoice ans SpeakJet shield boards can be interfaced. That is all I have for you for now! I will add more about the Raspberry Pi as I find the time!